Full disclosure: I used to think very highly of Steve Ballmer. This was around the time of his insane "Developers, developers, developers!" incantation at a Microsoft Family Meeting in 2000. But much has changed since then. Steve has decided that original software development doesn't matter anymore. 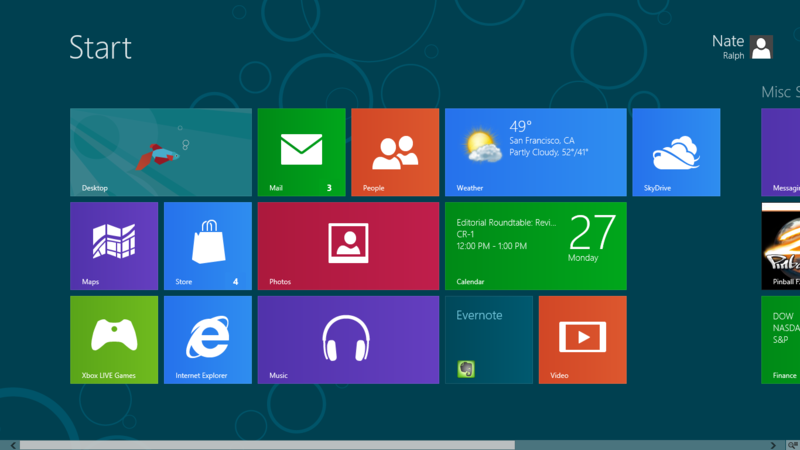 Instead, it's all about "Advertisers, advertisers, advertisers..."
And so we come to Windows 8. But somehow Ballmer found a way to add to the misery. Windows 8's new "Metro" interface not only frustrates users, but reduces them to an infantile, pre-verbal condition, where one is supposed to point and touch things in order to indicate want. Very forward-thinking indeed. Well, Apple used such touch interfaces on its mobile devices, and everyone thought they were cool. So, the 'logic' goes, it would also be cool if we had the same interfaces on desktop computers, even though, well, desktops are used for completely different purposes. But coolness and image are more important than vulgar usability, right? I mean, that's all Apple is — image — right? I am willing to let history do the decisive speaking on this issue. But the cards are already being revealed, and, I can say one thing myself: if you own any Microsoft stock, sell it immediately.